Okay, be honest. How many of you think a Dutch Oven is a type of oven only used by cooks in the Netherlands? Phew, I knew our readers were not only blushing brides and dashing grooms, but also masters of cookware. If you haven’t heard of a Dutch oven, we’re here to fill you in. While it does have origins dating back to the 18th century in the Netherlands, nowadays you can find them all around the world. A Dutch oven is sometimes referred to as a casserole dish, but it is really a bit more than that. It is a very heavy duty pot that basically contains heat inside to cook whatever you want to throw in (like meat or vegetables) and therefore reduces the amount of heat and energy you need to use from your gas or electric. Once the Dutch oven is up to temperature, it retains heat for as long as you need. Go ahead and turn your culinary attention to this wonderful piece of kitchen equipment. A modern day kitchen is about so much more than simply a fridge, oven, and microwave. Our kitchens are becoming more and more high-tech, as ideas widen, and cooking skills deepen. Furthermore, investing in the best Dutch oven on the market will certainly lead to a better overall cooking experience. What makes for a good Dutch oven? One key feature of a good quality Dutch oven is a tight fitting lid – an imperative to keep heat inside. In addition, for safety reasons the handle on top should be able to withstand high temperatures when you pick it up. What can you use a Dutch oven for? Well, anything really! Slow cooking, braising, and baking are all acceptable cooking methods that require a lot of heat to soften meat or vegetables. Put simply, a Dutch oven is not only a piece of equipment you should have in your kitchen for occasional use, it’s a piece of equipment which should last you a very long time. Cast iron – long-lasting; however acidic food could react inside, which means it needs to be seasoned and coated first. Porcelain – You’ll have to spend a fair bit of cash to get a good quality one, but it’ll last a long time. Stainless steel – Fantastic for conducting heat, and doesn’t need to be seasoned or sealed. Copper – High quality, but does need to be seasoned and sealed (acidic food can react as with cast iron). Price will likely play a role in deciding which Dutch oven you end up buying. Like many purchases in life, if you can spend a little extra money then you’re going to get more in the way of quality. Size-wise 6 quart is probably the most versatile to use for whatever you may need to cook. Look at smaller sized options if you want to save a bit of cash. Other features to consider include whether or not you need it to be non-stick; such ovens require less effort to clean, but can scratch a little easier. The handles should certainly be sturdy for lifting, and the lid should be tight fitting, with an easy to grab handle for safety reasons. Also look at the actual make up of the pan – it should be very heavy, with thick sides, and consist of a thick bottom section to make sure that the heat is kept firmly inside the pan during the cooking process. ​We took a look at many different ovens and came away with reviews of three top Dutch oven contenders. Lodge is a solid name in the kitchen equipment world, and that alone should provide some peace of mind in your cookware shopping endeavors. The EC6D43 enameled cast iron Dutch oven from Lodge is 6 quarts in size, which makes it big enough for Thanksgiving dinner, a Christmas party, or whatever occasion you’ll break it out for. It’s also comes in a variety of colorful options, which means you can make sure your new pot fits in with your kitchen décor! The ​EC6D43 Dutch oven is certainly heavy weight, which could be considered a pro or a con depending on how you look at it. The very nature of this type of cooking apparatus means that it should be heavy and bulky in order to keep the heat inside. However, the need to pick up and move around such a heavy object means you must take care when using it! The flexible nature of this pot means will have you slow cooking, marinating different meats, placing items in the fridge, or even in the freezer. You can happily use the product on different types of hobs, as well as a regular oven, including electric, gas, and ceramic tops. Having said that, you should not attempt to use this on an open flame outdoor or on an outdoor grill. Also, it can’t be used in the microwave. Many Dutch ovens need to be pre-seasoned prior to use in order to stop any problems during the cooking process, or to avoid acidic reactions. The enameled cast iron material of this Dutch oven means it doesn’t require pre-seasoning. Plus, rest safe knowing that you won’t have problems with chipping. Overall, an attractive Dutch oven that comes in many different colors, highly functional, with very few disadvantages. Another Dutch oven from Lodge, the L8DOL3 is instantly attractive due to its cast iron material and strong dual handles, which add to the safety and comfort of using the product. Lodge is a trusted brand name in the Dutch oven market, which is a good thing when you consider the lifetime warranty that comes with this Dutch oven. When investing money in a piece of kitchen equipment, you want to know that it is going to stand the test of time and the demands you place upon it. This particular item certainly stands up to t​he challenge. Another Lodge Dutch oven with positive user reviews, and few negative aspects. This particular product is only available in black, which could be a turn off for the trendy kitchen crowd. Yet, as Henry Ford once said, “Any customer can have a car painted any color that he wants so long as it is black.” I guess that applies to this particular Dutch oven as well! Aside from limited colour choices, it is a stylish-looking product that comes with an all important lifetime warranty. The shape of the Lodge is what really makes it special – a large, flat bottom to absorb more heat, along with a self-basting domed lid that acts to keep all the moisture inside the oven rather than drip down the sides. This comes in handy when you’re cooking meat because the meat will be more tender. In addition, any dish you are slow cooking will retain juices for extra flavor. Of course, the cast iron make up means that heat is effectively kept inside the oven for longer in a more even fashion. In terms of safety, when transferring the oven from your work surface to the oven and back again, the dual loop handles make it easier to avoid spillages or dropping the item. When dealing with a heavy oven (with even heavier ingredients inside), this is quite important. This product is pre-seasoned, yet despite that it is recommended to regularly spray or coat the inside with vegetable oil, to avoid any problems. Our final review also comes from Lodge – a 5 quart Dutch oven that is more than adequate for a small sized family, or perhaps a few unexpected guests as well. 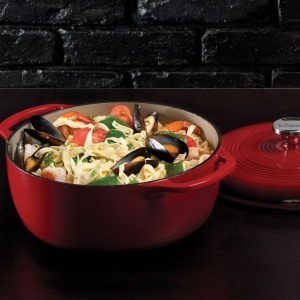 The Lodge L8DD3 cast iron double dutch oven more than adequate in size, and offers great value for money. Again, a pre-seasoned product made from quality cast iron. This stylish Dutch oven is a top product from Lodge. Two major advantages over other similar ovens is a deep 1.5” lid, and the fact that it can be used as a skillet – excellent value! In addition, integrated handles on both the lid and base are a good size, so you can easily lift it without worries. The fact that the oven works as a skillet is probably a huge selling feature. The oven is pre-coated, so you don’t have to do it yourself. Remember that for the first couple of uses the pre-coating may discolor and look a little like rust (which is not the case), and that the oil will simply disappear after a few uses, leaving you with a cleaner looking oven. If you’re not aware of this fact, you could be under the impression that something is wrong with your new product! The process is to make sure that the oil fully penetrates into the oven as deep as possible, thus providing a better cooking experience for you. Overall, the L8DD3 is a really good mid-budget Dutch oven , and the added skillet option is certainly a great bonus. ​Each of the three Dutch ovens above are fantastic value for money. The best advice when buying this type of equipment is to think of it as a long term investment. Buy a quality brand name and you’ll receive better value. A Dutch oven is built to last, and if you want one of the best on the market then you are going to have to make an investment by spending a few bucks! Out of the three products we reviewed, we like the Lodge EC6D43 due to its hefty weight and quality. The third option (L8DD3) doubles as a skillet and that could be a major selling point if you are looking for a multi-purpose piece of equipment. ​All three options above makes for a smart purchase, and we would be splitting hairs to pick a sole winner. Its really up to you and depends on what you want to achieve from your new Dutch oven. ​Remember, you don’t have to travel to a far off land of windmills and canals in order to take advantage of this wonderful method of cooking. We will end by wishing you all the best in your future culinary experiences!